Mike Solomonov, sneakers caked in mud, hands stained red from plucking mulberries, comes bounding across the field like he’s just picked the padlock on the candy shop. He carries a long, pale green vegetable resembling a peeled cucumber, albeit layered in downy peach-like fuzz. It’s a fakus, he tells me, a curious plant native to this part of Israel. “You can cook it like zucchini, or eat it raw like cucumber,” he says, breaking off a chunk and offering me a bite. It’s snappy, slightly bitter, and entirely delicious. “Right? !” the chef replies with a grin, sprinting back to the patch to harvest some more. We’re at Mizpe Hayamim, a mountaintop farm and wellness retreat overlooking the Sea of Galilee. 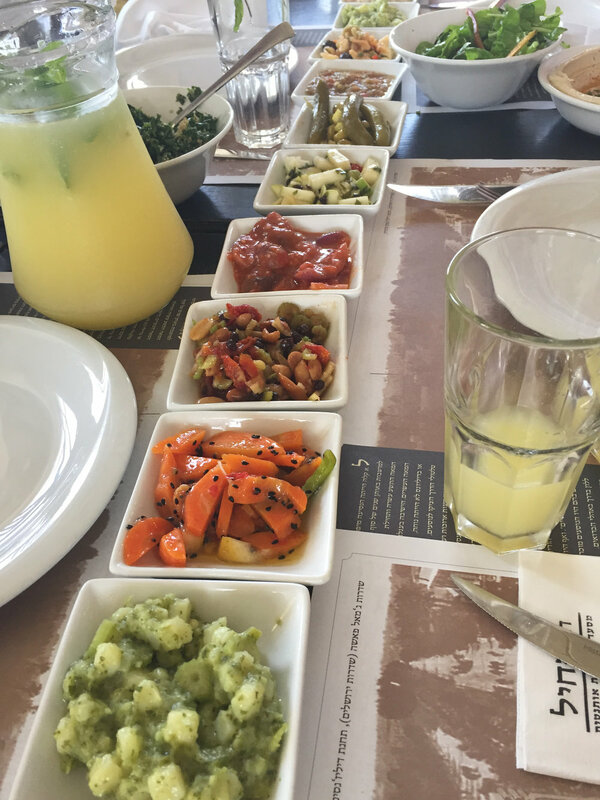 Most people visit Israel for the history, the monuments, but we’re here to ogle and devour as much food as possible. 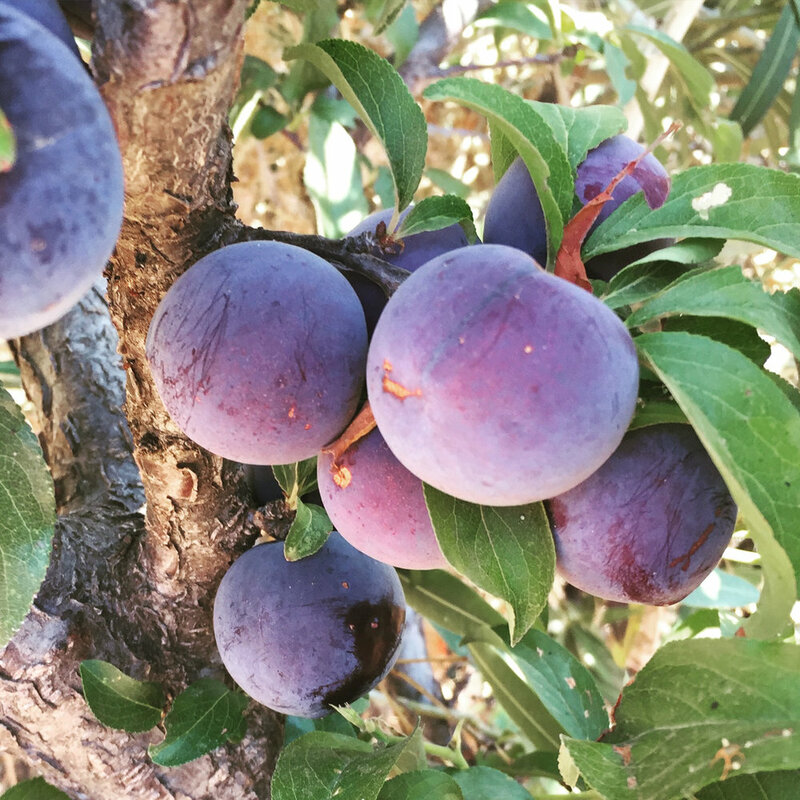 To that end, all morning we’ve been prowling Mizpe Hayamim’s fields in the summer heat: chomping into sun-warmed tomatoes, nibbling uprooted leeks, slicing tart green plums to sprinkle with fresh za’atar. At the edge of the farm there’s a rusted wire fence, and beyond that a hostile expanse of scrub and shale—a reminder that all this green bounty is the work of man. As emblems of Israeli agricultural ingenuity go, few can compare to this impossibly lush farm in the desert. 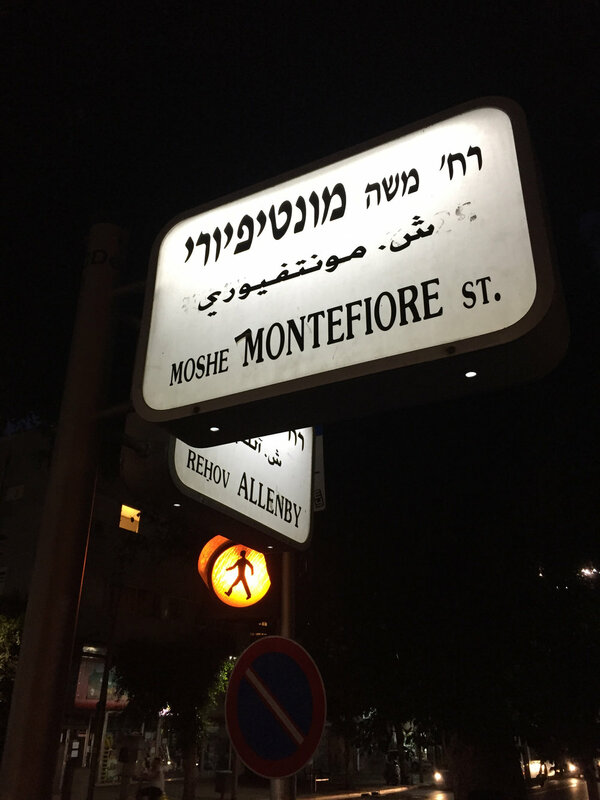 Solomonov was born just 80 miles from here, in the village of G’nei Yehudah, outside Tel Aviv. His family moved to Pennsylvania when he was 4, and though he’s spent most of his life in the States, he feels utterly at home in this landscape: picking za’atar and eggplants and mulberries and fakus, conjuring some tasty way to turn them into dinner. If you’ve been to Zahav, Solomonov’s Israeli-inspired restaurant in Philadelphia, you’ll know about his coffee-braised brisket, his grilled duck hearts, his smoked-and-braised lamb shoulder with pomegranate and Persian rice. But mostly you’ll remember what might elsewhere be considered mere accompaniments: the Moroccan spiced carrots, the beets with tehina, the twice-cooked eggplant, the pitryot hummus scattered with hen of the woods mushrooms, the fried cauliflower … good Lord, the fried cauliflower. That the cauliflower rivals the lamb as his signature dish is testament to the chef’s genius with vegetables, which become in his hands as id-fully craveable as any slow-cooked, fat-laced protein. “In Israel, vegetables are not an afterthought,” Solomonov writes in his new cookbook, Zahav: A World of Israeli Cooking. “In Israel, vegetables are the whole thing.” Last summer I joined the chef on a return trip to the homeland, to learn firsthand how that whole thing played out. To visit Israel with Solomonov is to eat lustily, impulsively, and nonstop, bouncing from one hummusiya or laffa cart to the next. The chef has the build, demeanor, and close-cropped hair of an athlete, and the energy of a jackrabbit. He’s up at sunrise to surf the breaks off Tel Aviv’s Gordon Beach. Afterward it’s a sprawling Israeli breakfast spread at our hotel—and then we’re off on a manic, multi-culti food crawl as we tag all the dishes on Solomonov’s must-eat list. This becomes clear on our first night in Tel Aviv, when we meet friends at a 1950s-era Yemenite shipudiya (grill house) called Busi, a longtime favorite of Solomonov’s. “These guys do amazing cow udders,” he assures us as we take our seats at a long booth. Within minutes, servers have set down dozens of small plates, lined up end to end—a runaway train of salatim spanning the length of the table. Starting a meal with a round of salatim or salads—traditionally a Palestinian thing—is now a given at most restaurants here. And this is no throwaway filler to tide us over, but a meal’s worth of flavors in itself, Israel on a single overcrowded table. All those tastes somehow fit together, with one dish coaxing out latent notes in the next. Solomonov begins dinners at Zahav the same way, with a cluster of starters that feel like the main event. At Busi, as at Zahav, one could leave after the salatim and feel entirely satisfied. Fortunately, we don’t leave—and now come the meats and offal, straight off the grill. Cow udders are no longer on the menu, their kosher status having recently been questioned by rabbinical authorities. (Only Solomonov seems disappointed by this.) But there is fabulous grilled onglet; flame-licked sweetbreads; grilled foie gras dangling off the skewer like molten marshmallows; and, best of all, crunchy-tender umami-bombs that I presume are chicken kidneys until he corrects me: They’re turkey testicles, and they’re gone in seconds. That low standard, he says, informed a certain bias against Middle Eastern flavors, which chefs and diners alike saw as both too simple and too exotic, at once over-familiar (falafel, pita bread) and confoundingly strange (preserved lemon, chicken hearts). “When I started out in restaurant kitchens, I didn’t think hummus or a chopped salad could ever be cool,” he says. Take, not least, that hummus. So beloved is Zahav’s rendition that in 2014 the chef opened a spin-off, Dizengoff—named for one of Tel Aviv’s main boulevards—dedicated wholly to hummus. (He has since opened a second location in New York.) As Solomonov notes in his cookbook, the hummus has just five main ingredients, “but it took us longer to develop than any other recipe.” The key, he says, is “an obscene amount” of tehina, made daily with organic sesame seeds, lemon, and garlic, which results in a far lighter and nuttier hummus. (Another rule: Hummus never spends a second in the fridge.) Simple as it is, the dish can also be dressed up—ladled with stewed favas (ful), with spicy ground beef and pine nuts (Jerusalem-style), or, in the classic masabacha preparation, with warmed chickpeas and a generous drizzle of olive oil. 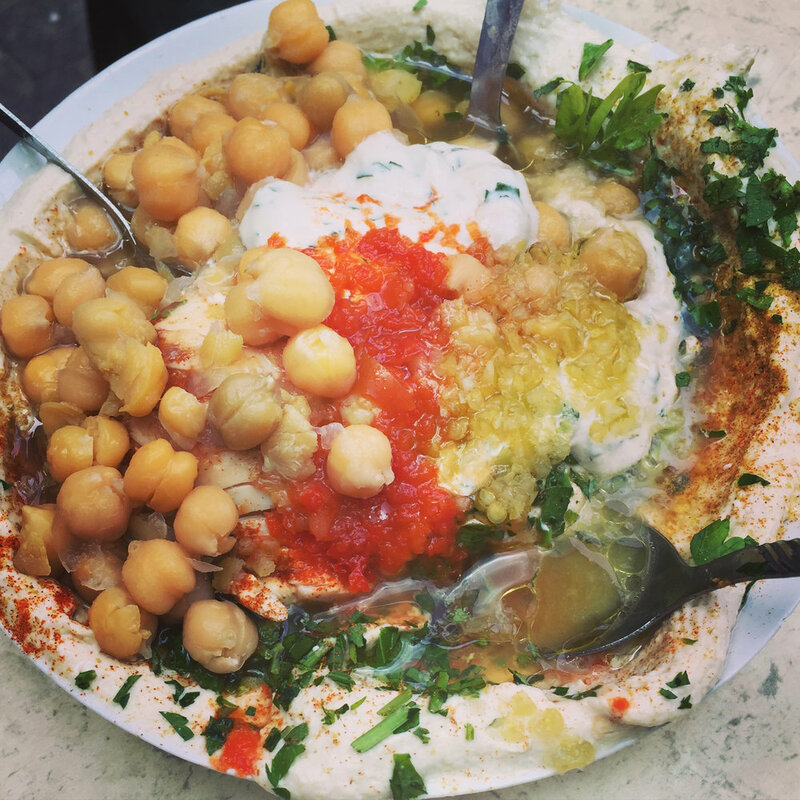 One of the best masabacha hummus preparations I’ve tasted (with Zahav’s running a very close second) is served at Shlomo & Doron, an indoor-outdoor, communal-seating hummusiya in Tel Aviv’s Yemenite Quarter, down a narrow lane from the Carmel Market. Purportedly founded in 1937, it also offers what the menu calls a “complete” hummus: piled with ful and simmered chickpeas, minced garlic, schug (a cilantro-spiked Yemenite hot sauce), fresh parsley, and—because you need it—a boiled egg. The absurdly rich assemblage of textures and temperatures recalls an ‘80s-era nine-layer dip; you scoop it up with fluffy, piping-hot pita or (better yet) wedges of raw, sweet, fiery white onion. Every ingredient blasts through with piercing freshness and intensity, which, as Solomonov points out, is what distinguishes dishes in Israel from the same ones back in the States. But it’s sabich, the fried-eggplant sandwich introduced to Israel by Iraqi Jews, that Solomonov hungers for as soon as he lands in Tel Aviv. Traditionally eaten on Saturday mornings, it happens to be a knockout remedy for hangovers and long-haul flights. 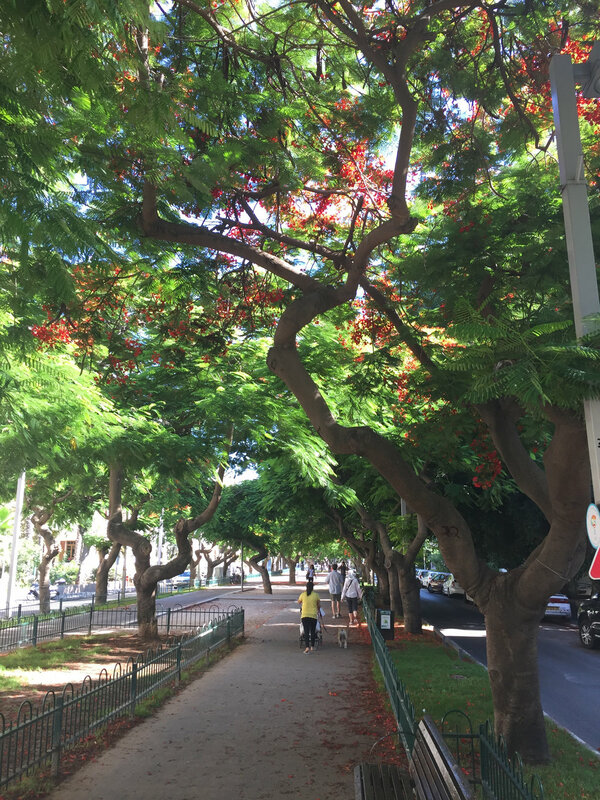 So here we are in suburban Givatayim, just north of Tel Aviv proper, on a side street lined with fiery orange poinciana trees, and although it’s barely 11 a.m., the line is out the door at Oved’s Sabich. 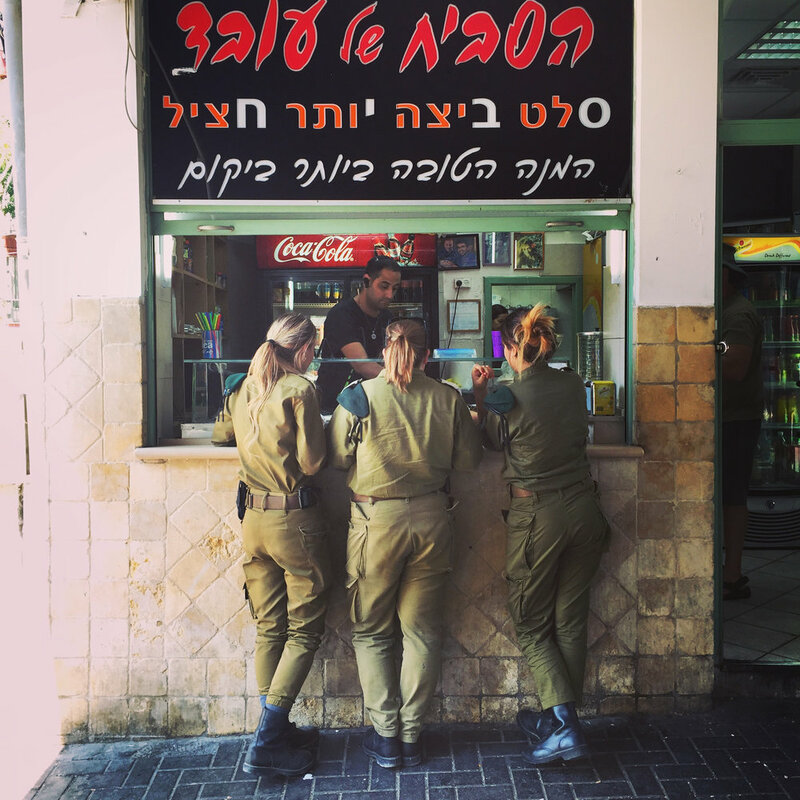 As we wait, three ponytailed women—IDF camouflage, machine guns slung over their shoulders—stand at a Formica countertop, inhaling their sandwiches in a minute flat. Finally we reach the front, order two for ourselves, and watch the line cook set to work. It starts with thin coins of eggplant that are brined, fried low-and-slow in canola oil, and left to cool; their appearance and mouth-feel recall Caribbean fried plantains. Into a fluffy pita they go, then on goes tehina and hummus, a spoonful of amba (a pickled-mango condiment), jalapeños, crisp cucumbers and diced tomato, and an egg that’s been boiled with coffee grounds and onion skins till the whites turn beige. Like nearly everything we’ve tasted in Israel, each bite is both intensely familiar and entirely novel. It is, indeed, a supremely well-conceived sandwich. When Solomonov returns to Israel, his first stop is often at one of the three Tel Aviv branches of this fast-casual pita restaurant from chef Eyal Shani, a local legend here. Jammed from morning to night with a mix of school kids, businessmen, and old neighborhood geezers, Miznon’s flagship on Ibn Gabirol Street comes off like a bunch of teenagers got stoned and opened a pop-up: the stereo blasts hip-hop and Israeli club boomers, the English menu is scribbled on a paper bag, and no one in the kitchen appears to be out of high school. Somehow they manage to turn out the most delicious roasted cauliflower in all of Tel Aviv—and if you’ve never put “delicious” and “cauliflower” in the same sentence, you clearly need to try this. Whole volleyball-sized heads of cauliflower go into the roaring oven for TK# minutes and emerge gorgeously browned and blackened—it looks like burnt brains, and it is brilliant. The consistency is somewhere between a steamed artichoke heart and a hard-boiled egg, the flavor nutty and earthy with a truffle-y punch. You can eat it straight or (Mike’s preference) stuffed into a fluffy pita that’s drizzled with tehina and dressed with cool lettuce, tomato, pickles, and jalapeno. Everything melds together in a soft, creamy mass, bearing the perfect integrity of a drive-thru cheeseburger. Pair it with a side of slow-roasted sweet potato (with a flavor like molasses) and you’ll need nothing else all day. Or at least for another hour. Moroccan carrot salad, baba ghannouj, and North African tomato-and-pepper stew are all part of the salatim spread at this 1950s-style grill house. Diners sit shoulder-to-shoulder and use raw onion and warm pita to scoop fresh masabacha hummus at this café near the Carmel Market. Sing and swig vodka alongside dancing Israelis at this popular watering hole, then refuel with grilled sweet apricots served at the bar. Israel’s diversity is on display at this huge emporium: Kiwis, dates, eggplants, pineapples, cukes, and avocados all come from within an hour’s drive. Unusual sandwiches, like the eggplant pita topped with coffee-and-onion-boiled eggs, are the perfect antidote to a Friday night out.